Material and Finish: Stainless steel posts with wood top rail. 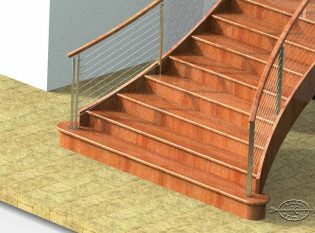 Description: Stainless cable railings for a Caribbean villa. When designing railing systems for outdoor applications, we have to take into consideration the project site’s natural environment. For oceanfront properties where salt permeates the air, we are careful to select building materials with natural corrosion resistance or to treat the materials with corrosion resistant coating. In the Caribbean, many homes feature glass NanaWall or lift and slide doors can that open up an entire side of the house. These applications open up the view and let in the breeze but they also allow salty air to pass into the home. Because of this, homeowners also have to choose corrosion resistant materials for their interior architecture. The natural corrosion resistance of stainless steel makes it a perfect choice for railing systems within waterfront homes. For our client who owns a private villa in Long Bay, Antigua, we fabricated a railing with type 316 stainless steel. Our Ithaca Style railing was chosen as the basis of this design for its clean simple lines. We created a unique adjustable top post to allow for some height variation in the handrail supports. This was important because the mahogany handrail rail was hand carved by local island craftsmen. 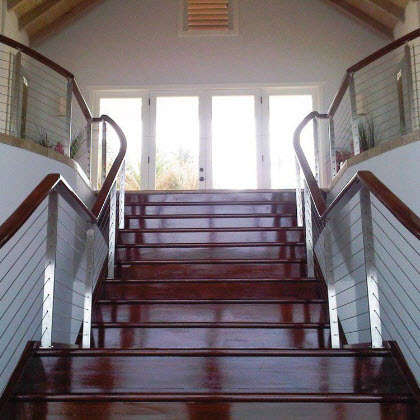 After finishing the stairs with a clear varnish, giving the grand entrance to the villa a warm and fresh feel.